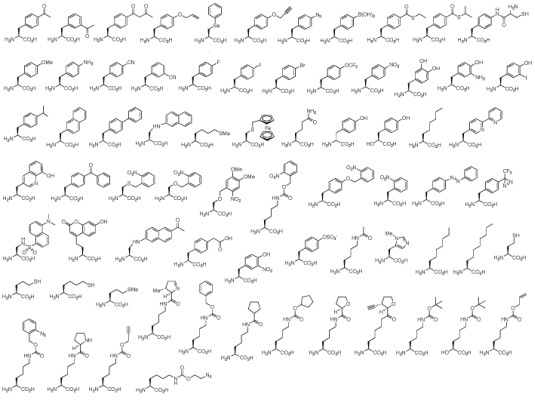 Dozens of unnatural amino acids with a wide range of functions have been genetically encoded by several labs worldwide, including Schultz, Chin, Liu, Lemke, and others. The amino acids have architectures of varying structural complexity and size, often requiring extensive active site engineering of the tRNA synthetases. We are focusing our biological engineering and organic synthesis efforts on amino acids that can be optochemically activated, be used for bioconjugation reactions, and carry biophysical probes to report protein function, folding, and localization. In order to genetically encode them, the amino acids need to be soluble, cell permeable, non-toxic, and stable in a cellular environment.